Thanks for stopping by. 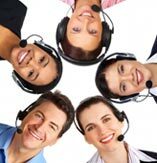 This site examines the cross-cultural trend of headset-wearing customer support representatives on corporate websites! While supplies last, we aim to provide 1 per workday for your entertainment and analysis. The popularity of “Headset Hotties” is fascinating to view them from both the perspective of someone who is familiar with their widespread use and as an internet viewer with fresh eyes. While they can be a comforting face in a confusing online world, they are just as often a default design component. This website celebrates the former and challenges the latter. We examine this balance with a scale of “Perceived Helpfulness,” which is admittedly unscientific, but nonetheless cuts to the essence of why they appear so frequently, peppered throughout corporate customer support pages. Thanks for visiting, and enjoy the collection!